Home Lawyer@home Helpful Home Tips Want to know in advance when to pop the vitamin C tablets? Want to know in advance when to pop the vitamin C tablets? 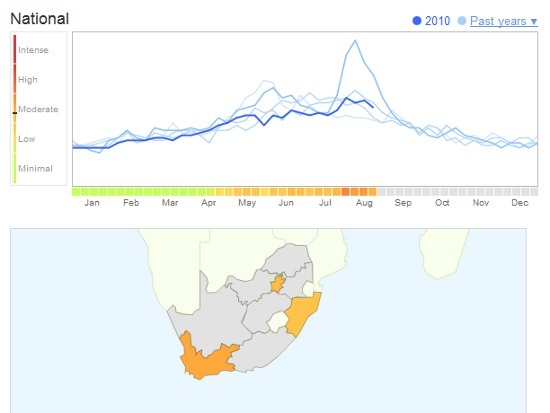 Google now has a system based on the keyword searches for remedies and symptoms which allows them to extract the stats and give accurate reports on flu trends in Gauteng, KwaZulu Natal and Western Cape. The image to the left gives you another way to prevent flu (kids don’t try this at home!). They have used the same stats for previous years so that you can see the pattern and work out how bad the flu will be this year. The data has been compared to official influenza surveillance data and the pattern from Google FluTrends matched that of the researched data. Here is the link to the current flu trend for South Africa. Here is an example of the flu trend for 30th August 2010, notice how we peak at the end of May and again in mid-August (sniff). Next articleLegal Blogs Are Dead! Long Live Legal Blogs!